Inspiring Connections Outdoors is an all-volunteer group that leads urban youth on outings to explore beautiful wildlife in public spaces around Las Vegas. enabling a child to find joy in nature gives the earth a new friend. This is every child's right. So far this year, Las Vegas ICO has led 27 outings from local schools and community centers, involving 272 youths. On November 4 ICO will host its annual event seeking funds and volunteers. When: Saturday, Nov. 4 from 6 to 8 p.m. Details: $20 for dinner and entertainment. A raffle and silent auction helps us bring urban youth into the outdoors. It's a chance to meet and greet our volunteers while enjoying a beer/wine bar plus dinner by Chef Michael Jones and live music by "In Good Company." New donations and more funding for Chicago’s youth services will help brighten the city’s future, according to local youth mentoring experts, and the money is slowly flowing in and expanding youth programs. Youth Guidance’s Becoming a Man program has expanded to 16 more Chicago Public Schools on the Southwest Side with the help of donations from Exelon, a Fortune-100 energy company; Get In Chicago, a community advocacy group against violence; Peoples Gas, a utility company; and ride-share service Uber, according to a Sept. 22 press release from Mayor Rahm Emanuel. The city is making strides toward reaching its universal mentoring goal by 2018. These donations will help the city reach an additional 2,000 youths by this fall, the press release adds. So far, the city has helped 90 percent of its goal of mentoring 7,200 at-risk youth by next year—half of whom will be reached through Mayor Rahm Emanuel’s Mentoring Initiative, which was announced in his 2016 Public Safety Address, as reported Sept. 26, 2016, by The Chronicle. LaResha Love says working for Mortenson Construction changed her life. Beginning in January when she was a senior at Bradley Tech High School until she left for college at University of Wisconsin-Stout a few weeks ago, Love worked as a youth apprentice for Mortenson at the new Milwaukee Bucks arena construction site. This academic year, 250 MPS students will have the opportunity to participate in the statewide youth apprenticeship program – up from 46 last year – made possible by Wisconsin Department of Workforce Development (DWD) funding. As youth apprentices, high school juniors and seniors work at local companies based on their subject interests, earning income and experience. Milwaukee Public School works with the employers to match the students with mentors. The statewide youth apprenticeship program has been connecting students to employers since the 1990s. Because MPS's program will experience exponential growth this year, school leaders must now find more employers to participate. “They need to be aware of this pipeline of young talent,” said Terri Salzer, MPS’s youth apprenticeship coordinator. In many cases, employers assume young people lack the interest, related coursework and experience to work successfully in a professional environment, she noted. Story Stitchers provides a creative outlet for young artists ages 16 to 24. Ideas for Story Stitchers include dance, spoken word, hip hop, videography, photography, writing workshops and publishing. 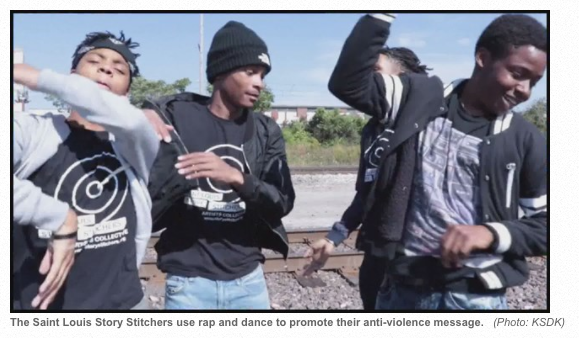 Clark, who enjoys dancing, joined Story Stitchers to be a role model. Story Stitchers goes beyond performances, organizing community forums like gun violence summits featuring stakeholders and experts from the community. It’s young people using their skills to be part of the solution. Kenneth Holloway never saw himself as an artist. But then his teacher, Gloria Byers, challenged him to create a piece of artwork using corrugated cardboard, a selfie, pastel chalk and other materials. The result: A colorful self-portrait using mixed media that was so good, it was selected to be on display during the Detroit Public School Community District Student Exhibition at the Detroit Institute of Arts. "It feels good to let people see my work, to see that it means something," said Holloway, 17, a senior at Osborn College Preparatory Academy. His artwork is one of hundreds of pieces on exhibit beginning Saturday at the DIA, an annual display that gives students a unique opportunity to showcase their talent. It's the 80th such exhibition at the museum, and is the longest-running partnership the DIA has with an educational organization. The Detroit Public Schools Foundation and the Ruth T.T. Cattell Education Endowment Fund funded the exhibition. Follow the link for more photos and additional info.